The greatest physical evidence of Canada’s legacy as a nation of flight training is the network of community airports across the country Generations of military and civilian pilots from around the globe have come to our country to learn the skills and techniques necessary to master their craft. Much of our country’s aviation infrastructure – namely airports – exists thanks to Canada’s commitment to teaching the world how to fly and they remind us that we have to be proactive in preserving them for future pilots. The current stewards of these airports, usually the local municipality, often have varying degrees of competency when it comes to turning a few kilometres of pavement into a viable economic engine for the community. A 2017 study produced by COPA pegged the value of General Aviation to the Canadian economy at $9.3 billion. 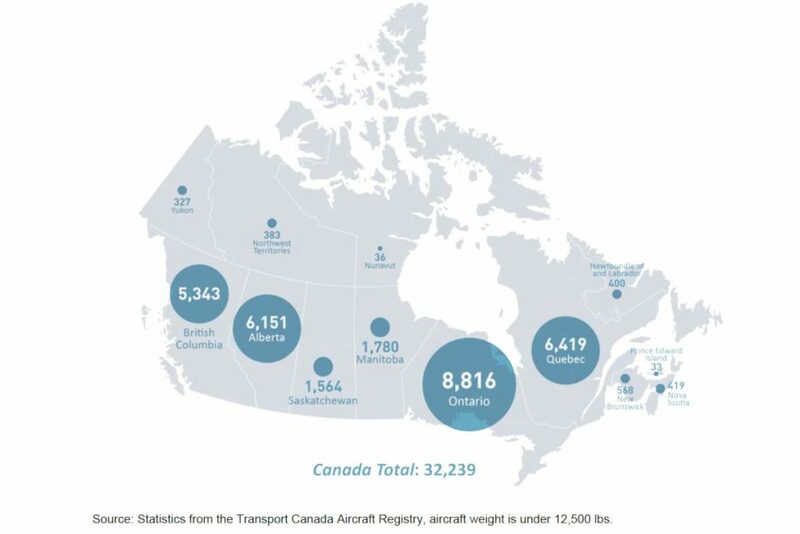 Based on Transport Canada’s Civil Aircraft Register, there are more than 32,200 GA aircraft in Canada. The majority (87 per cent) are fixed wing aircraft, numbering over 28,000. There are roughly 2,800 rotary aircraft, comprising nine per cent of GA aircraft and the remaining four per cent are classified as balloons, gliders or gyroplanes. Based on the report’s analysis, the economic output from the operation of the more than 32,200 GA aircraft in Canada generated $1.4 billion in wages, $2.2 billion in GDP and $5.4 billion in total economic output. With numbers like that, why do airports keep closing? Recently, a group of members in southwest Ontario looking for help to save their airport contacted COPA. The airport had languished for years with no investment, little activity, and badly needed to show its contribution to the community. The situation had become so dire that the municipality was threatening to close the airport if no solution was found. We armed our members with our economic impact study and the talking points necessary to present its contents to Council. At the meeting where the vote was to be held about possibly closing the airport, the members gave their presentation and came away with a successful motion to spend $75,000 on a new strategic plan for the airport. The inverse of such leadership is poor management that drives away innovation and investment. One particular airport in northern Ontario is notorious among the GA community for its exorbitantly high fees – including where the airport invoices for parking over and above the fees paid to the FBO for the same service. The management claims that is the cost of doing business, but it creates a scenario where pilots avoid the airport unless necessary. There is no doubt that running an airport is not the cheapest endeavour, however statistics show time and again that high fees drive pilots away. Raising the fees higher to compensate for lost business does little to encourage pilots to return. Several case studies included in the previously mentioned economic study show that, done properly, local community airports do not need to have scheduled airline service to be positive economic generators for their community. Another community airport on Vancouver Island recently had to fight for their existence against a municipal government who was more interested in condominium developments. In that case, one of the key issues was the length of the leases for the business on the field – businesses with plans to expand and hire more workers and make an even bigger contribution to their community. Without some certainty to justify their investment, those plans unfortunately were put in abeyance. Because, in Canada, there is no federal infrastructure money available for airports unless they have scheduled air service, and provincial funding is piecemeal, it can often be difficult to convince mayors and councils to invest even modest amounts in airports. In politics, the money goes where the votes are, and usually those votes are found in hockey rinks, fire halls, and filled potholes. Not necessarily at the local airport, even if that airport is booming with flight training, maintenance, aerial operators, and other job-creating businesses. As Canada’s GA community, we have an equally important duty to not only advocate the regulator on issues that affect aircraft, but also to educate municipal leaders and the neighboring community that the local airport is a critical asset to their region and every bit deserving of business-minded leadership intent on supporting the airport. If no one steps up than no one will likely notice when the kilometer of runway becomes a new housing development. Carter Mann is manager of government affairs & communications for COPA.